Never mind you are what you eat. Consider you are what you paint. Artist/illustrator/watercolorist Denise Hilton Campbell’s above watercolor rendition of petunias suggests naturally that she is a lover of botanicals. View her collective works and we add people lover and foodie to the list. An illustrator of books, advertising art, fine art prints and commissioned work, her preferred expression is Watercolor. Her client list would agree. Moved by nature, both exquisite (petunias) and devastating (Japan), she captures the simple act of the everyday into a myriad of emotions with ethereal brushstrokes. Lovingly for the drooping petals of a happily exhausted flower. Tearfully in the running watercolors of a tribute to a country’s unthinkable nightmare. See more of Denise’s work on her Website and her Altpick Page. 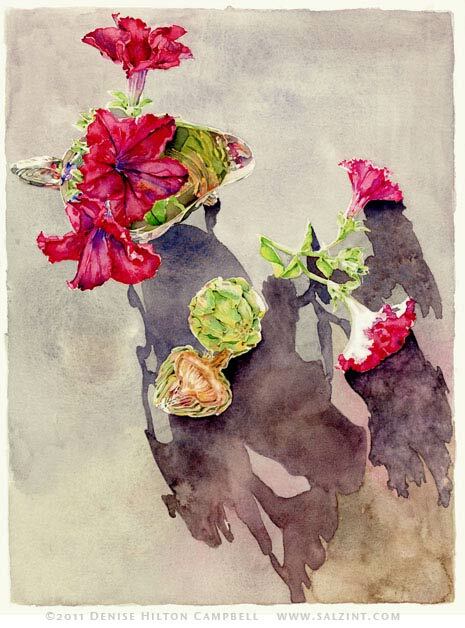 This entry was posted in Art, Illustrations and tagged flowers, japan, petunias, watercolor. Bookmark the permalink. What I like about this painting is the quiet beauty that is combined with the decaying haunting shadows. Very nice juxtaposition!